Whether or not a band is unknown is pretty subjective. While I was at the Portraits of Past reunion show in Berkeley recently, many passers-by and uninformed parents continued to ask who was playing. They saw the line of 500-plus kids and couldnt believe that this line was for a band they had never heard of. In this case, sometimes spectators are just out of the loop, which could make any number of bands unknown to them. A similar thing happened this first time I listened to this record, All Is Well. 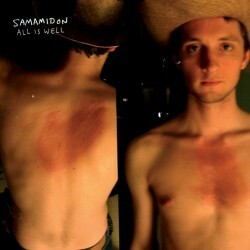 Samamidon is Sam Amidon, a folk singer from Vermont. This is his second full-length release, and I feel foolish for not noticing until now. Sams sound seems pretty minimal, but he brings a great sense of melody and rhythm to the table, and a dash of various instruments throughout the album to keep things interesting. It seems obvious how much time was taken to write each song, making sure every note and string of vocals is placed just right. The album begins with Sugar Baby, a slow acoustic track thats both increasingly pleasing as well as saddening. The song follows a single pattern throughout, but never gets old on your ears. Sams vocals remind me a lot of The Dismemberment Plan, despite the differences in their music styles overall. The next track, Little Johnny Brown, sounds a lot more traditional at first, but brings in a few horns, a piano, and even a set of strings that really bring out the harmony. The end of the song reminds me a bit of a more experimental Iron & Wine, with an odd percussion instrument helping to build up the crescendo towards the end of the track. All Is Well keeps a consistent style of keeping you on your toes. From the sparse ballad of Wild Bill Jones to the upbeat banjo of Fall On My Knees, Samamidon really seems to have put a lot of effort into making this album unique. Every song seems to have the same goal to help paint a canvas that is the album as a whole. While each track stands on its own, whats more important is how each track plays a role in crafting a piece of work that exercises every facet of this mans talent. Samamidon seems to be doing something right. His abilities are undeniable, and I hope to see much more of him in the future. At an even ten songs, All Is Well works all of its magic and doesnt leave anything flawed or lacking. Im rarely this impressed on a group thats new to me, but this one definitely did it for me. Posted Aug. 12, 2008, 1:08 a.m.